Looking forward to a fashionable Labor Day weekend out East? Don't miss the Montauk bash that everyone will be talking about! 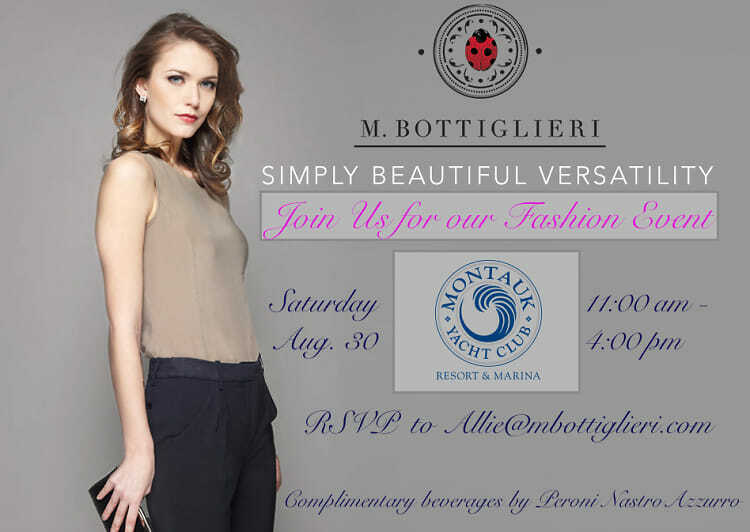 You're invited to luxury womenswear brand M. Bottiglieri's stylish launch at the Montauk Yacht Club this Saturday, August 30th. Enjoy makeup touch ups, a hair and braid bar, and the M. Bottiglieri college station, which will provide expert styling tips for job interviews and more—all while discovering the NYC-based Italian brand for women. M. Bottiglieri is a new luxury fashion brand based out of NYC and Rome. Inspired by the easy elegance and warm vibes of la coccinella (Italian for "ladybug"), the brand's debut line offers clean-line designs, functional versatility, and the utmost sophistication. Rendered in the highest quality, all-natural Italian fabrics, their pieces are sure to become wardrobe staples for all women. Come see what the brand has to offer and receive a complimentary gift bag valued at over $125 with every purchase. There will also be a meet and greet with M. Bottiglieri designer and founder, Salvatore Vitiello as well as plenty of chic bites and beverages provided by Peroni Nastro Azzuro.